Kettle Chips certainly keep it simple. And so shall we. Colour coded bags. Colours associated with the flavour. Minimalist design. Plain but fairly perfect. We included the write up for the standard Kettle Chips design because this is only a minor variation. The fonts are the same, the bold colours individualising the flavours are the same. But this time, a chopping board plays host to a simple photo of the ingredients. Kettle knock it out of the park again. Kettle may not be the standard setters, but they do provide the optimum Crunch whatever your marking scale. A firm Crunch resists giving way to mulch until well into the eating process and never at any time does a much stage appear. The usual irregularly shaped Crisps, as are always found in Kettle Cooked Chips bags. There was a smattering of hardened oily areas and some blisters to accompany them. The basic colouring was a medium density yellow. We have never made it a secret at Chips and Crisps that we struggle to review Plain / Salted Crisps. Of course it is the most natural of flavours, with little more than added Salt to the wonderful sliced potato we are so familiar with. Indeed, it was the first of its kind and the most raw in value. However, to us, it’s all just a bit boring. We get it – Chips and Crisps were a gift from the heavens, but so are the flavour and varieties now available to manufacturers. Anyhow, we wouldn’t ordinarily set off on a diatribe, but to offer up a play ground quote –they started it! A lot of Crisps manufacturers partner up with other companies, but this is the first occasion that we have come across a partnership with a Salt company. 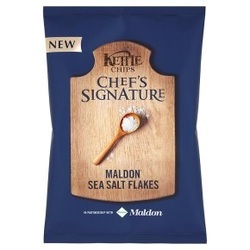 Maldon Salt, it proudly declares on the bag, so we will review it accordingly. And here goes... It tasted just like every other Ready Salted / Plain / Regular Crisp, but if anything, a little less salty than some. Were they nice? Yes, of course – Regular Crisps are always nice. They just don’t offer anything new.